Manhattan Declaration, Statement or Alliance? That's Not a Cam; This is a Cam! You may notice a trend here, in that the constant "180" is used in many of these formulas. That is because most cam specs are given in degrees Before Top Dead Center / After Bottom Dead Center, etc. rather than using a full 360 degree scale. For example, an intake valve may be opened at 15 degrees before the piston reaches TDC on the "power" stroke. It will remain open for the full 180 degrees of the "intake" stroke, and then close at 31 degrees after BDC of that intake stroke. Add those three figures (15 + 180 + 31) and you get the 226 degrees of duration as listed for an Andrews EV13 cam. note: if anyone has any corrections to any of these formulas, please let me know. I am working from a 40 year old high school education, and I often wish I had a couple of those Algebra and Geometry textbooks handy to refresh my memory. Godreports.com is a web site that is set up to be a sort of a information clearinghouse for missionaries and Christians interested in missions. Quoting from the site: "In the psalms, David writes: “Proclaim among the nations what He has done.” On the Godreports website, you and your organizations will have a place to do that. If you see your life in terms of mission, you can create your own “Godreport,” describing what God is doing through your ministry." I had the pleasure of meeting Mark Ellis, the President of Godreports this fall. We instantly hit it off, and after some discussion of the marvelous grace of God, Mark asked me if I had ever written out my salvation testimony. I had, and to make a long story short, it is now posted on the Godreports web site. The Godreports web site is worth a look, with a lot of information on it. I think having one place to check out numerous missionary efforts worldwide is a great concept, and I suspect more organizations will be taking advantage of it all the time. About a week back there was a short entry on a blog that I follow endorsing the Manhattan Declaration Note that if you click on the link I just provided, it takes you to the home page of the Manhattan Declaration, not the declaration itself. I have to admit that I mistakenly read the home page, and went from there to a page to sign, and never noticed that I had not read the actual declaration. And I may never have noticed my mistake, but for another blog that I follow coming out strongly against the declaration. So what is this declaration all about? In a nutshell it is a statement affirming the sanctity of human life, the dignity of marriage as the union of husband and wife, and the rights of conscience and religious liberty. Not exactly the type of thing that I would normally expect to find denigrated on a blog that I normally find edifying. But it seems that there were a couple items that made this declaration anathema in some quarters. One "problem" was that the declaration includes Orthodox, Catholic, and evangelical Christians. The other was this statement: "It is our duty to proclaim the Gospel of our Lord and Savior Jesus Christ in its fullness, both in season and out of season." As a matter of fact, it is this second statement about the gospel which alerted me to the fact that I had not read the actual declaration before signing it. When the declaration was condemned for implying that Catholics taught the true gospel, I had to go back and look because I didn't recall any mention of the gospel in it. Now anyone who knows me well can tell you that I am about the last guy on the block to endorse any sort of ecumenism, however after reading the entire document and considering it much more, I must admit that I do not believe I made a mistake in signing it. The document says nothing about joining together to proclaim the gospel, and I certainly believe it is my duty to proclaim the gospel to the best of my ability. The three issues that are the meat of the declaration are all one's that I am willing to put my name to in support. The declaration does not even speak of joining together to accomplish any goals, but only to affirm the sanctity of human life, the dignity of marriage, and the right of religious liberty. I am thankful that those of our founding fathers who were Christians (and most of them were), were willing to put their name to a document that affirmed that God has given us rights such as life, liberty and religious liberty, dispite the fact that they did not all belong to the same denomination. "But that was a political document", you say? Sure it was, and so is the Manhattan Declaration. And for those who are too "spiritual" to ever dirty their hands by becoming involved in politics in any way, shape or form, I hope they are prepared for the persecution that is sure to follow the downfall of this nation as it was founded. In my last post I featured a Leineweber # 5 Knuckle cam. This elicited a response from a reader, Jim Franco, saying that he has a cam that recently came out of a Knucklehead hillclimber with lobes that looked quite similar. He was kind enough to send me some pictures of the cam, which I have posted here. 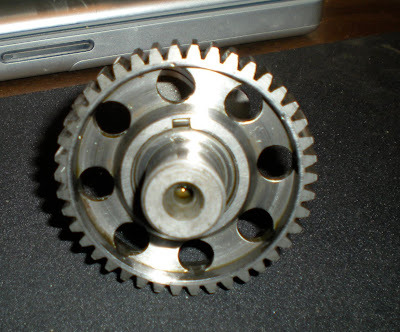 The holes in the drive gear immediately bring to mind the legendary Knucklehead "Lightning" cam. Contrary to what seems to be popular opinion, I do not believe that the Lightning cam was the only factory cam to have these holes. 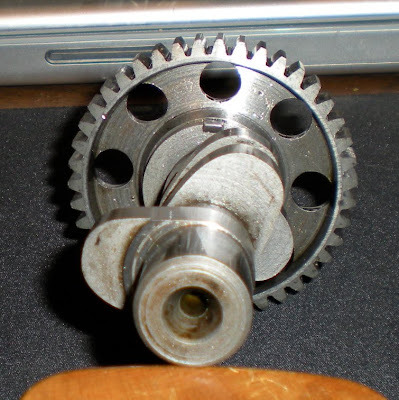 As can be seen in the above picture, the lobes do have the radical shape similar to the Leineweber #5. I have heard the Lightning cam referred to as the "banana lobe cam." I am not sure if this was a common slang term for it or not, but one can certainly see where the name came from. I ran a factory Knuckle cam which had holes like this in my street bike for a few seasons. The lobes did not visually appear any different from any other stock Knuck cam, and it did not perform noticeably better. I also do not remember a keyway, like the one seen in the above picture. Barring someone with more knowledge of the elusive Knucklehead Lightning speaking up, I am very inclined to conclude that Jim has himself a genuine one here! Thought you might enjoy seeing a somewhat rare cam. This is a Leineweber #5 Knucklehead cam. It is .540" lift with the Knuckle's 1:1 rocker arm ratio. The description for this cam is as follows: Radical racing cam. Designed for fuel, alcohol, or gasoline. 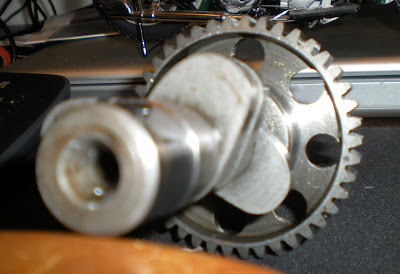 Major engine modifications needed to fit this cam. Expert engine builder a must. Is that cool or what? The lobes at 8 and 12 o'clock are the intakes, and the milder exhaust lobe is the one at 3 o'clock. 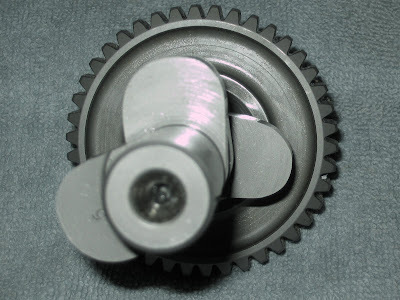 Jim Leineweber only lists his Knuck cam specs at .020" lift. For this cam the duration is 318 degrees on the intake and 298 degrees for the exhaust. The picture doesn't do it justice as to just how radical this cam looks! Twenty + years ago a local drag racer from the '60s and 70's, the late Doug Gall, showed me a cam which Jim Leineweber had ground for him. He told me it was one of Jim's first. It was a stock cam that had been welded up and reground. As I recall, it had much this same shape to the lobes. The best part is you can still get one of these for your own nitro burning Knucklehead at leinewebercams.com (or contact me).